How different are Millennials, Gen X, and Boomers really? If being an effective manager is understanding who you’re managing, much of that knowledge comes down to understanding the generation that identifies your workers. EY, formerly Ernst & Young, includes insights from more than 1,200 professionals across generations and industries about the strengths and weaknesses of workers from different generations, based on the perceptions of their peers. It finds that Millennials are tech-savvy, but aren’t great team players. Gen X-ers are entrepreneurial-thinking, but rank low on executive presence. And last, but not least, Boomers are team players and loyal, but don’t adapt so well. The participants from the study were both managers and non-managers. “As management shifts to younger generations, the research reveals areas companies can focus on to enhance skill sets, address the challenges of managing multiple generations, and retain and engage employees by understanding which workplace perks they may value most,” Karyn Twaronite, a partner of Ernst & Young, says in the study. PROS: Members of Gen Y are believed to be the most tech-savvy (78% of respondents agree) who know how to use social media to leverage opportunities (70% of respondents agree). These younger workers are also regarded as being the most “enthusiastic” (68% of respondents agree) about their jobs. CONS: Gen Y-ers scored the lowest on being a “team player” (45%), “hardworking” (39%) and “a productive part of my organisation” (58%). 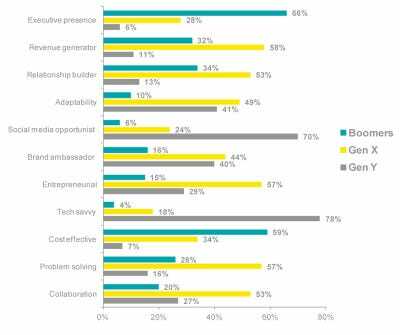 PERKS: More Gen Y respondents wanted to know when and how they can get a promotion (13%) compared to Gen X-ers (5%) and Boomers (4%). PROS: Most of the respondents in the study (70%) believed that Gen X are the most effective managers compared to managers from the Boomer (25%) or Gen Y (5%) generation. 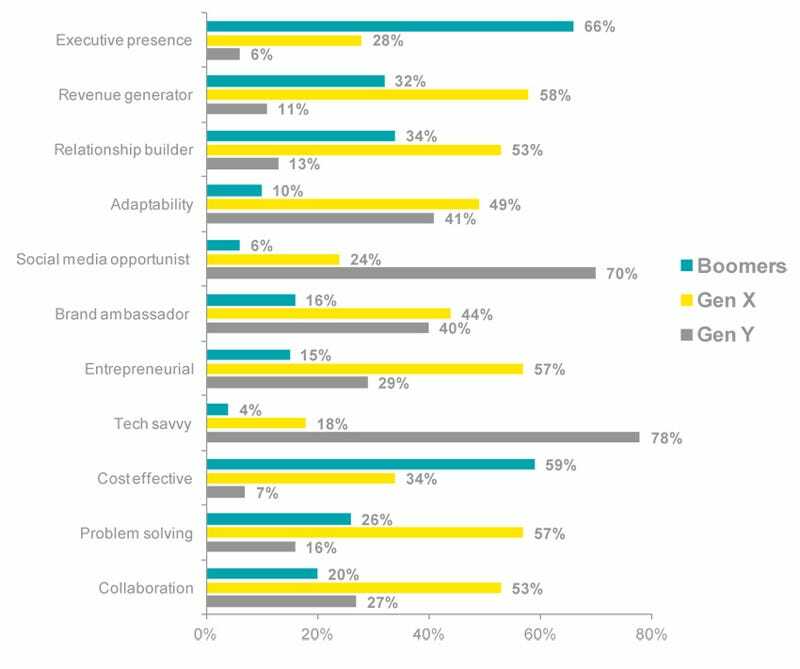 Members of Gen X scored the highest when it comes to being a “revenue generator” (58% of respondents agree), possessing traits of “adaptability” (49% of respondents agree), “problem-solving” (57% of respondents agree) and “collaboration” (53% of respondents agree). CONS: Gen X-ers scored the lowest compared to other generations when it comes to displaying executive presence (28%) and being cost effective (34%). PERKS: Gen X respondents ranked workplace flexibility as the most important perk (21%) and are more likely to walk away from their current job if flexibility isn’t available (38% versus 33% of Gen Y and 25% of Boomers). PROS: Baby Boomers ranked the highest when it comes to being a productive part of their organisations (69% of respondents agree), “hardworking” (73% of respondents agree), a “team player” (56% of respondents agree), and mentoring others (55%). CONS: On the other hand, Boomers ranked the lowest when it comes to being adaptable (10%) and collaborative. PERKS: Not surprisingly, Boomers (28%) identified benefits, such as health care and retirement, as the most important perk compared to Gen X (19%) and Gen Y (147%). The study found that cash is still considered the most important perk across all generations, with 49% of respondents agreeing this is the case.